I was planning to create an installator that will do everything required. However, months are passing by and nothing is happening, so I decided to just write up what I did manually. execute build_sdk.cmd in the command prompt. Should the compilation be succesful, you can find the installer at %SPOCLIENT%\BuildOutput\public\Release\Server\msm\MicroFrameworkSDK.MSI and the Visual Studio extension at %SPOCLIENT%\BuildOutput\public\Release\Server\dll\NetmfVS15.vsix (you need to install both of these). I have packed some updated icons and names into this VSIX, enjoy! The MSI installer comprises two parts. First, it install all the assemblies, emulator (as well as the mentioned Microsoft.SPOT.Tasks.dll) into Program Files, usually %PROGRAMFILES(X86)%\Microsoft .NET Micro Framework, and second, it installs the target files for msbuild, usually into %PROGRAMFILES(X86)%\MSBuild\Microsoft\.NET Micro Framework. The problem is that Visual Studio 2017 does not refer to this shared msbuild folder anymore as every instance has now its own folder. That's where we have to deliver the target files. The trick is to find where on disk the instance is. 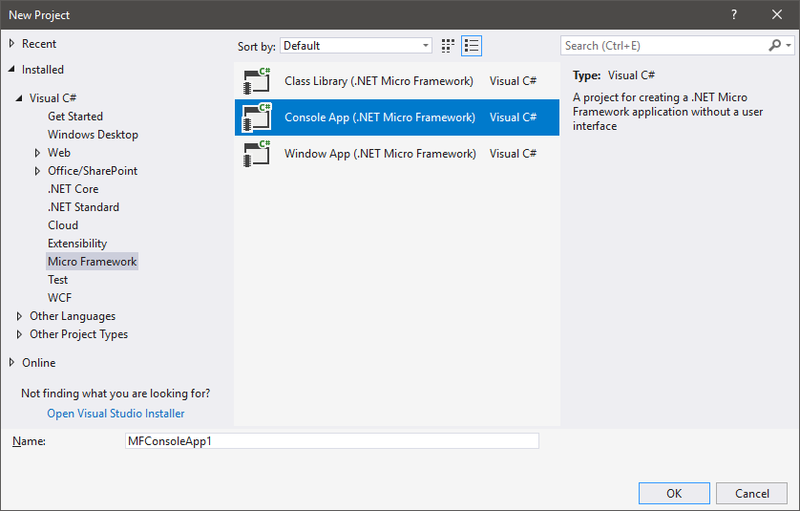 The idea is to find something like C:\Program Files (X86)\Microsoft Visual Studio\[instance name]\[edition]\MSBuild\Microsoft\.NET Micro Framework\v4.4. Last step is to copy all the folders for older versions next to it, i.e. all the folders from %PROGRAMFILES(X86)%\MSBuild\Microsoft\.NET Micro Framework. Tip: executing Environment.GetEnvironmentVariable("VSAPPIDDIR") in the C# Interactive window in Visual Studio will give you a hint where to look for that instance on the disk. used the precompiled ones, they work like a charm Thank you so much for your effort in making this happen!